High voltage is defined as a voltage, that is higher than the low voltage of 1000 V. The maximum we are able to do is at 50 kV AC. The AC high voltage output has the following special characteristics: One terminal is connected to earth (- minus pole, green/yellow connector) and the other terminal is connected to the high voltage side (+ plus pole or hot side). 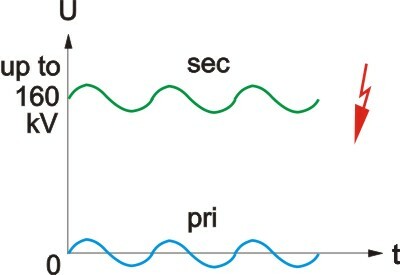 The current is calcualted with the power I = P/U and is usually given in (mA). The frequency is at 50 Hz sinusoidal. For special fields of application, frequencies can be higher. We already built transformers with 20 kV and 1000 Hz. The insulation test primary - secondary is done with 120% of the high voltage value. High potential means a separation of a potential that is close to earth and a potential that is very high e.g. 20 kV or 100 kV over 0. The separating voltage is given in kV DC. The maximum we are able to produce at the moment is at 160 kV potential difference. These transformers are also known under the synonym isolation transformers.